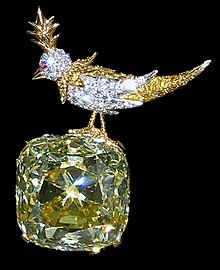 The Tiffany Yellow Diamond is one of the largest yellow diamonds ever discovered; its carat weight is 287.42 carats (57.484 g) in the rough when discovered in 1878 in the Kimberley mine in South Africa, and was cut into a cushion shape of 128.54 carats (25.108 g) with 82 facets—24 more than a traditional round brilliant—to maximize its brilliance. The facet pattern features eight needle-like facets pointing outward from the culet (bottom) facet. Jewelry and diamond historian Herbert Tillander refers to this as a 'stellar brilliant cut', and lists the gem in his book "Diamond Cuts in Historic Jewelry - 1381 to 1910" (1995) among other such diamonds: The Cullinan Diamond, The Koh-I-Noor, the Polar Star, the Wittelsbach, among others. The gem was on loan from Tiffany & Co. to the Smithsonian National Museum of Natural History in Washington, D.C., from April 18, 2007, until September 23, 2007. At the time, Jeffrey E. Post, the museum`s gem curator, said that this was the largest diamond on display in the U.S. The famous Hope Diamond is only 45.5 carats, which is about one-third the mass of the Tiffany Yellow Diamond. The diamond is known to have been worn by only three women during its lifetime. It was worn by Mrs. E. Sheldon Whitehouse at the 1957 Tiffany Ball held in Newport, Rhode Island, mounted for the occasion in a necklace of white diamonds. It was subsequently worn by Audrey Hepburn in 1961 publicity photographs for Breakfast at Tiffany's. In 2019, Lady Gaga wore the diamond at the 91st Academy Awards. Wikimedia Commons has media related to Tiffany Diamond. ^ Glover, Carson (September 14, 2012). "Tiffany Unveils the Legendary Tiffany Diamond in a New Setting" (Press release). Tiffany Co.
^ a b Thompson, Ryan (2004). "The Tiffany Yellow". Famous, Historic and Notable Diamonds. ^ Schon, Marbeth (2006). "Review of Bejewelled by Tiffany: 1837–1987". modernsilver.com. ^ McCarthy, Lauren (February 24, 2019). "Oscars 2019: Lady Gaga's Priceless 128.54 Carat "Tiffany Diamond" Necklace Was Last Worn by Audrey Hepburn in 1961". wmagazine.com. Retrieved February 24, 2019. ^ @VVFriedman (February 24, 2019). "She's already won biggest jewel" (Tweet). Retrieved February 24, 2019 – via Twitter.